Stanislas Wawrinka is a Grand Slam champion. One more time: Stanislas Wawrinka is a Grand Slam champion. Who did? It happened absurdly. When it seemed certain Wawrinka would lose, he dominated Rafa Nadal. When it seemed certain Wawrinka would win, he nearly lost. He took the first set smoothly and broke to start the second, hitting freely and easily. Nadal was the one who looked overwhelmed by the moment, rocked back by his opponent’s pace, cunning angles, and the punishing weight of his shots. But after Nadal injured his back, it was like Wawrinka had no idea how to respond. Instead of moving his immobile opponent around, he struggled with his timing or hit the ball directly back. The third set was a nightmare. “I was like, OK, miss, miss, make a mistake, because I’m not going to win the match because I’m nervous,” he said afterward. As impossible as it seemed that Rafa could win, it seemed entirely possible that Stan would lose. He nearly beat himself. After he hit his final forehand, hard and flat, he waited a moment before raising his arms. Coming into the Australian Open, Nadal, Novak Djokovic, Andy Murray, and Roger Federer had won 34 of the past 35 majors — nearly every major for the past nine years. Of all the guys who might push them, Wawrinka had especially staggering stats. Before the Australian Open, Wawrinka had lost to Djokovic 14 times in a row. He had lost to Nadal all 12 times they played, all 26 sets. He had lost 39 of his last 40 matches against Djokovic, Federer, and Nadal. But he was closing the gap. He hired a new coach, improved his game, grew stronger and fitter. A year ago, he was ranked no. 17; by the end of 2013, he was ranked eighth. He was consistently reaching the second week of slams. But at the Australian Open, the French Open, and the U.S. Open last year alone, Nadal or Djokovic knocked him out. Some of the defeats were crushing. And he had spent his whole career in the obliterating darkness of Federer’s shadow. Wawrinka was known as the second Swiss, if he was known at all. Today, Wawrinka is the no. 3 player in the world. He deserves this spot. He is the first player to beat Djokovic and Nadal in the same Grand Slam, the third player (after Federer and Djokovic) to beat Nadal in a Grand Slam final, and the first player in more than 20 years to beat the nos. 1 and 2 seeds to win the Australian Open. For good measure, he defeated Tomas Berdych, a crazy-talented ball striker just outside the top group. 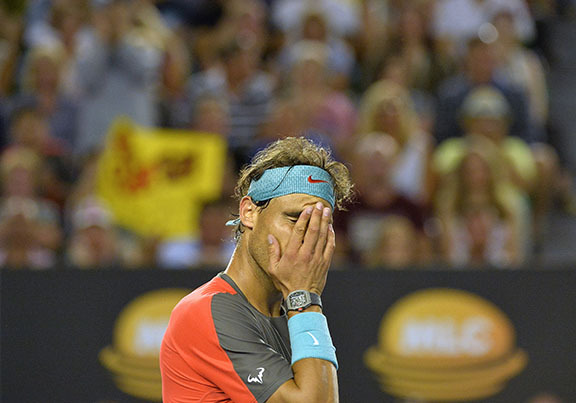 And yes, Nadal was injured during the final in Melbourne — but Wawrinka had been the superior player even before Rafa called for the trainer, and Nadal’s injuries are part of the physical, sliding, pounding, twisting, reaching, ripping way he plays. Nadal will still be the favorite going into Roland Garros, but the dominance of the Big Four is ending, not just in the rankings but also in Grand Slam results. Wawrinka has earned his place near the top. Which is why, to me, Stan is the best of all of them. Every player outside the Big Four has hit the wall. But for Stan, losing to the top guys again and again wasn’t just reality — he turned his failure into a kind of faith. It’s a cliché for an athlete to say he learns from his mistakes, but Stan has a certain kind of red-nosed, straightforward dignity about him, something that makes me believe he lives a more compelling, better way of life. He had to accept that he was always going to be overlooked, that he was not, and would not become, the best. He had to find different dreams, other ways to gauge his improvement, new definitions of success. He transformed his game. He carried himself with quiet command. New opportunities seemed to open for him. Who knew what could happen? At the U.S. Open, and again in Australia, I thought — and it seemed strange at the time — that he might win. I liked the style of his game, powerful and bold, his beautiful strokes. The strength of his legs when he skids outside the ad court, turns his shoulders coyly, and whips a wicked backhand across the court. His quickness around the court and his surprisingly supple hands at the net. His ability to control a shot with pace and send his forehand skidding down the line. But I also liked him because I wanted someone outside the Big Four to win, and I just wanted it to be Stan. He was human in a way most athletes weren’t. You could tell he sometimes felt small. You could tell he was not Roger Federer. He has a different kind of confidence in himself, one I’m not so accustomed to. He didn’t need a Grand Slam title, though it’s fantastic that he has one. He didn’t need to beat Nadal, didn’t need to do what Federer couldn’t. You don’t watch tennis players because they have something to teach you about how to be. That is almost always a mistake. But I would be lying if I didn’t say I’ve learned some things from Stan and his dreams. That was true even today. I was tempted to think this win redeems all the losing, that failure is finished with this success. This isn’t, though, where his story ends. He’ll play again, and he’ll lose again. Before he went out on the court, his coach, Magnus Norman, gave him some good advice: “He told me it was important not to think about the result but think about the way you want to play, the way you want to win every point,” Stan said. The point of playing, as it ever was, is to play each point as you want to play. Stan didn’t need to win, but I couldn’t be happier for him. It was a strange tournament, but it has a deserving winner. “There’s a big chance I get drunk tonight,” Stan said after the match. Cheers to that, and then, sweet dreams.